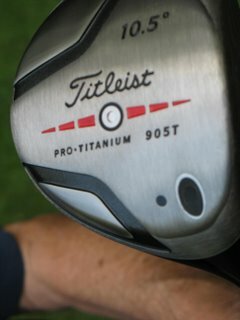 I checked this club out on my EatGolf product shopper engine (you should try it), and it is a $160+/- club....but my golf buddy got it for free just for drinking beer. "My God man!" You say. "How does one do that?" A couple weeks ago, after a golf round, our neighborhood group went to a favorite watering hole to grab lunch. The owner had put up a sign that they were raffling off this driver. "All ya have to do is drink the sponsored beer for a raffle ticket" he explained. Well, we were as excited as Columbus GA little-leaguers, as we ordered multiple bottles of the fine grog.....you know....purely to stack the odds in our favor....oh the sacrifices we make. Well my buddy gets a call from the bar last night saying he'd won! He ran...ok, shuffled...over to my house to tell me the good news. 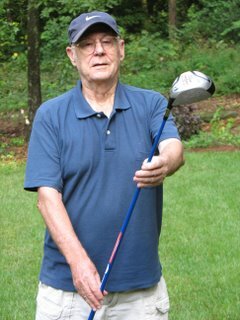 We picked up his club (had a celebratory beer of course), and discussed the fine quality of the club (it has a bright blue Graffalloy stiff shaft....very sweet). He plans on all of us playing golf this weekend, and sharing his new club by letting us tee off with it whenever we like. "What good is winning something if you can't share it with someone." he said. P.S. With Labor Day approaching, let's all be thankful of the laborers before us that celebrate this long weekend with us, and share a toast with them. funny thing...my buddy just gave me the exact same driver two weeks ago. he bought something new and didn't want it anymore so I was glad to take it off his hands. So far, I've hit very well with it.